The LATimes today has yet another great post/article about LA Bike messengers (LATimes calls them couriers, but we know better 🙂 )chasing down a bike thief, knocking him off the stolen bike, and returning the bike to its owner. Anyone here know who they were? So, from what I hear, this is what happens Now when you steal bikes or bike stuff from messengers or any cyclist in downtown.Word on the street is a couple of high school bike thieves were caught by a messenger in the act of petty larceny, e.g. stealing some commuter’s bike wheel. Messenger says, “hey what ya doing?” and calls another messenger. Kids try to act tough, but the amounting messenger population descending upon them like large squawking scavenger birds began to eat away at any courage and conviction they might have had left. Instead of beating them to bloody pulp and sending them home in their own private ambulance (like the other times that this has happened) these messengers thought better of their opportunity: they stole back … jeans, dickies, shirts, hats, jewelry, shoes … everything save one sock and two pairs of properly soiled boxers. As for the all the stolen items, they were quickly donated to the needy homeless person who calls downtown home. If I lose hope with the balance of the universe, which I do from time to time, I must say, it these sweet morsels of serendipity that makes up for a lot of it. Here’s to non-violence and [hopefully] how effective it can be. There were some signs that I’d ignored. Earlier this year, Federico (here) and I (here) each blogged about an incident where three eco-villagers had emerged from a movie to find wheels stolen. That night, I felt pretty smug that I always carry around two locks, and that I hadn’t lost any wheels. Earlier this month, Jimmy Lizama posted an email about a friend’s stolen bike on the eco-village listserve. Alex Thompson posted a couple of blog entries recently about thefts. I should have been on alert. Yesterday, I took a nap. I had some articles to write for my turn as an actual modestly-paid guest blog writer at L.A. Streetsblog. There were some files that I wanted to use on a PC instead of the (generally wonderful, but now and then incompatible) open source computer where I’ve been working. I biked out to the internet cafe at around 10:30pm… drank some caffeine and got in a groove writing and didn’t emerge until 3am. I walked home dejected and swearing… and I really don’t swear very often. So… how did I contribute to this incident? 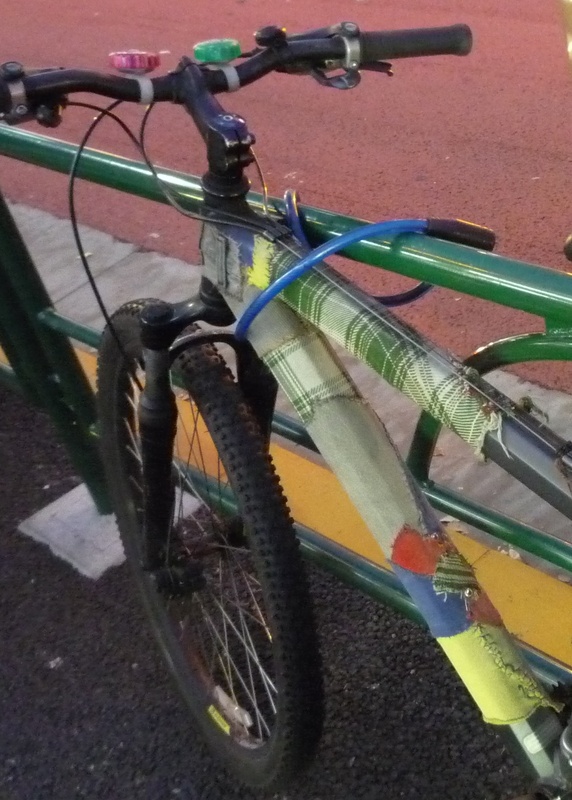 Well… I confess that I locked my bike badly. I did use two locks… but I only locked one – the above cable lock – to the bike rack. The other – a small U-lock – I used to lock the back wheel to the frame. When I arrived, there was another bike locked to the city inverted-U-rack that was perpendicular to the rack, making it very slightly difficult to lock mine properly. My incorrect mental calculus was that I would be in there for an hour or two, and I was right near a subway portal at a pretty busy intersection with lots of pedestrians, so it was ok to just lock it the way I would at a parking meter or other pole. This sort of thing works in front of a restaurant during the day… but, as the results indicate, it’s a bad way to lock a decent bike in the middle of Los Angeles in the middle of the night. I should have turned the other bike around, so it was parallel to the U-rack, so I would have clear room to secure my bike in two places. This would have taken me all of 20 seconds… but there were a few folks standing and walking around… and I stupidly didn’t want to touch someone else’s bike for the slight fear that they could see me moving it and get upset with me. The conspiracy theorist in me thinks that there’s a possibility that the other bike was placed there by thieves deliberately a bad T-angle so as to discourage others from parking correctly. So… friends and fellow travelers… be on the lookout for my bike around town… it’s the blue one in the photo above – it looks more-or-less like that picture, though it has more stickers and new kinda-bulky black plastic mountain-biker pedals. It’s a big frame (I am 6’3″) light blue Trek, 24-speed, about 3 years old. Bontrager (sp?) black/gray puncture-resistant slick road tires. Lots of stickers – C.I.C.L.E., FoLAR and others. There’s a faded green paper flower and a large Chinese bell on the straight handlebars. There’s a basic black utilitarian rack on the back. I hereby resolve to lock my bikes really really well in the future. so last night i went to watch a movie with Joe and Yuki at the vista and when we came out, slightly disappointed by the movie i must say, we had three wheels stolen. it was like a gradient of good to bad locking practices. Joe had a U-lock locking the frame and one wheel and an extra cable lock for the other wheel. i had a U-lock locking my rear wheel in the fashion discussed here by Sheldon Brown and Yuki had her u-lock just locking the frame only. and in that order Joe had two wheels left, i had one (my bike on the picture), and Yuki none. sad as it is we all saw it coming. i have heard rumors of more and more bikes and wheels being stolen in L.A, but had failed to take any further measures. i’ve been locking my bike in the same fashion for at least four years and this is my first time having a wheel stolen on the street. i had been trusting that thieves out there where going for the quick releases and not carrying that 15mm wrench you need to steal most of those fixed gear wheelsets. fixed gear bikes have are increasingly popular and i think that is great. bikes in Los Angeles are increasingly popular and that is even better -in fact that is one of those things a lot of people here at the LA Eco-Village have been dedicating ther time and their lives to- and popularity is desirability. and with more people desiring bicycles, more bicycles will be stolen. so our three wheels rolling in the horizon seem to me like a good sign. a sign that the city is changing for good. its also a reminder that any change we desire has unintended consequences. but carrying and extra lock in exchange for more people riding bikes and cleaner air seems like and ok compromise to me. now, friend/neighbor/co conspirator Jimmy Lizama pointed that L.A. bike riders have had a recent history of using and displaying ultra fashionable bikes, from colorful deep V rims to imported keirin frames from japan, and that might be coming to an end as people start favoring practicality. call it uglyfing of camouflaging your bike, or just getting a beater bike that you will not mourn too much if it gets stolen, L.A. bike owners might start behaving more like riders from other cities like San Francisco or New York or Amsterdam where bike theft (and bike usage) is just part of life. Jimmy Lizama on Voyage L.A.
New Intersection Rep… on Intersection Repair Videos!